MANIC MONDAYS continues to push the envelope of SF nightlife FWD. 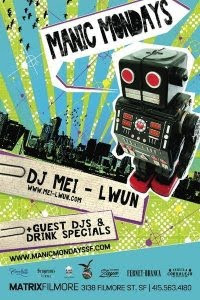 For Nov 9th we feature resident Dj Mei-Lwun and special guest Dj Tony Tone on the set. The original mixed bag weekly party MANIC MONDAYS rolls on!! !